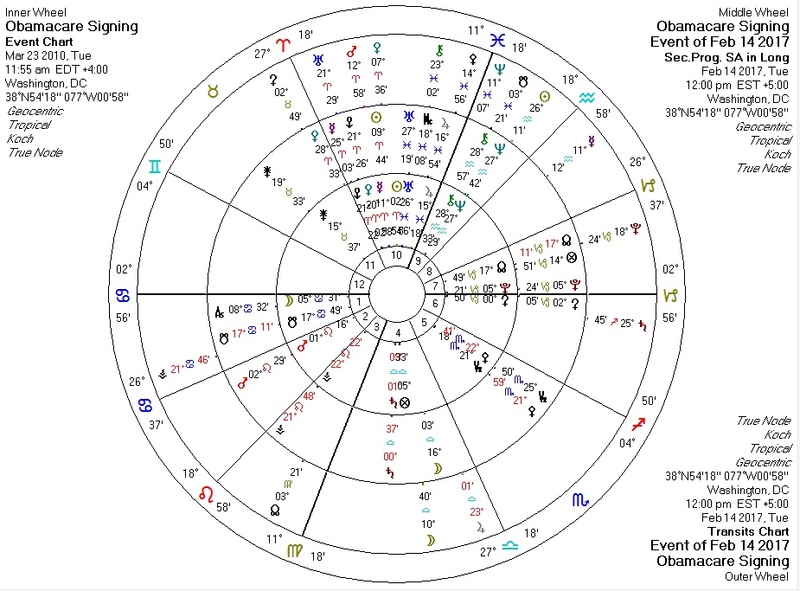 Above is the Obamacare chart on the day of the Trump executive order which gave the IRS the option to stop enforcing the Obamacare individual mandate. Here transiting Uranus (interruption) is tightly conjunct Obamacare's Venus (funds). Above is the Obamacare chart on the day of the IRS policy change that tax filers no longer need specify their health insurance status. Here transiting Pallas (ethics) is conjunct the Midheaven, representing the triumph of ethics in the context of the healthcare law. And above is the Obamacare chart on the day that Reason and Drudge reported the IRS policy change to the public. Pallas has moved from the Midheaven to Obamacare's Jupiter (publicity) and now the "cat is out of the bag" and Americans who read conservative/libertarian media are now aware that they can plausibly avoid the Obamacare individual mandate penalty. 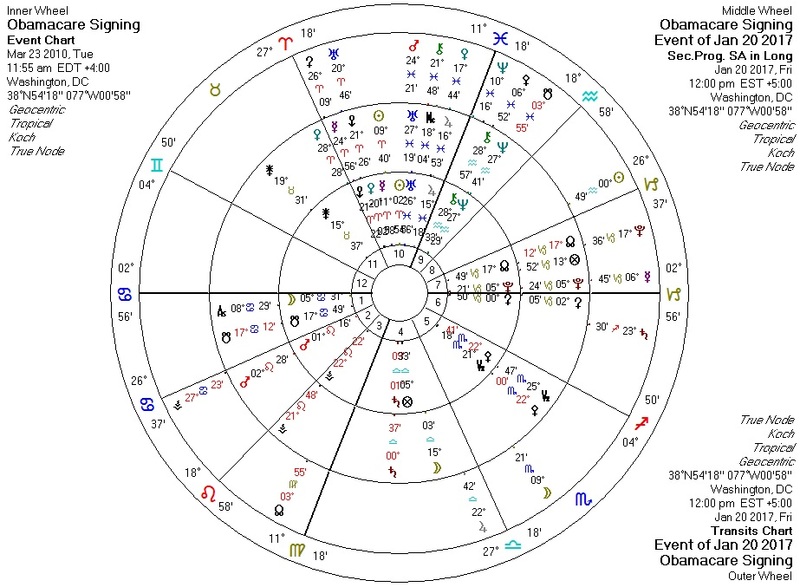 For all of these charts, transiting Pluto (death?) 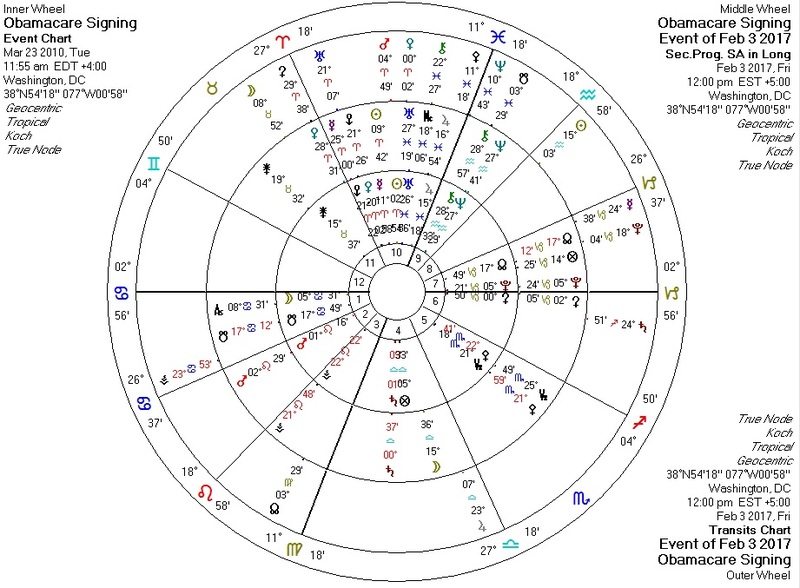 is conjunct Obamacare's North Node (receptivity) and the progressed Moon (health of the entity?) is square the nodal axis (karma). This also means that the progressed Moon is forming a square aspect with transiting Pluto. I wonder if the perfection of this aspect will be the final death-knell for the healthcare law.